Ayushmann Khurrana, Kriti Sanon and Rajkummar Rao are ready to entertain the audience with the upcoming romantic comedy Bareilli Ki Barfi. As the release date fast approaches, the makers are promoting the film on different platforms. The lead actors were on the sets of the comedy show The Drama Company in Mumbai on August 1, 2017. Kriti, for the promotions, opted for an ethnic outfit and looked great while Ayushmann appeared in a checked jacket, shirt and a trouser. 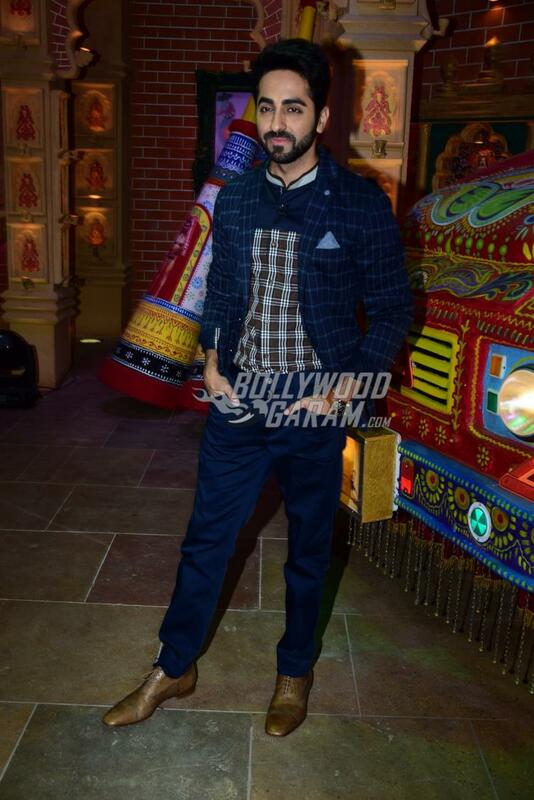 Rajkummar too carried a casual look with a t-shirt, a casual jacket blue pants and blue sneakers. Going by the pictures, it seems like the actors had a great time interacting with the comedians Bharti Singh and Krushna Abhishek. The show also saw Anita Hassanandani interacting with the guests on the show. The film Bareilli Ki Barfi is directed by Ashwiny Iyer Tiwari and is produced by Junglee Pictures BR Studios. Bareilli Ki Barfi also stars Pankaj Tripathi, who will be seen playing Kriti’s on-screen father. Next articlePHOTOS - Sushant Singh Rajput undergoes training at NASA for Chandamama Door Ke!